UC apiculturist Eric Mussen graciously spoke to Madera Tribune reporter Ramona Frances recently when she sought information about the medicinal properties of honey. 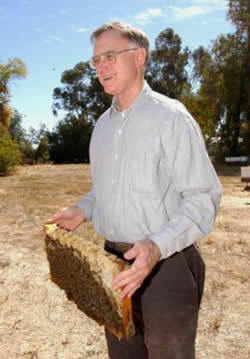 Mussen is known for his expertise on honey bee colony management, pollination, mite control and insecticide damage. Having already logged 30-plus years of honey bee research, Mussen is well-versed on findings that the pollinators produce more than a delicious, amber sweetener. "Honey is extremely good for burns and wound healing as a whole," Mussen is quoted. "But you are not going to get many medical professionals to say this. If something goes wrong, they would rather avoid a suit." Mussen also spoke about propolis, a resin bees extract from plants to fill cracks in their hives to stop drafts. In the lab, it has proven anti-fungal, anti-bacterial and anti-inflammatory properties. "Most people who have ulcers have a bacterium problem," he told Frances. "We didn't know that for a long time; we know that now. We have seen it (honey and propolis) knock out organisms in a petri dish, but what happens in your stomach - we don't know."